Having a clear reticle makes it easy for your eye to instantly focus on the target. If your reticle is not in focus, your eye will try to focus on the image, but it will cause the muscles in your eye to strain. Most quality scopes have an adjustable focus on the ocular lens housing, adjust your reticle into focus while looking into the blue sky, or any other blank space. 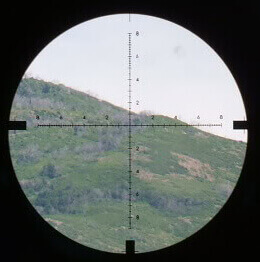 Once the reticle is sharp and clear, you are ready to go.